1. Did you watch the Food Revolution last night? Betcha never look at mass produced ground beef the same way again. We love tacos in the Sweet Pea home, but sometimes, tacos can equal a lot of last minute preparation. We end up with components for the tacos across the counters, and while this is not something about which I want to complain, it does make for a lot of set-up and clean-up on a busy weekday night. Enter Taco Lasagna. 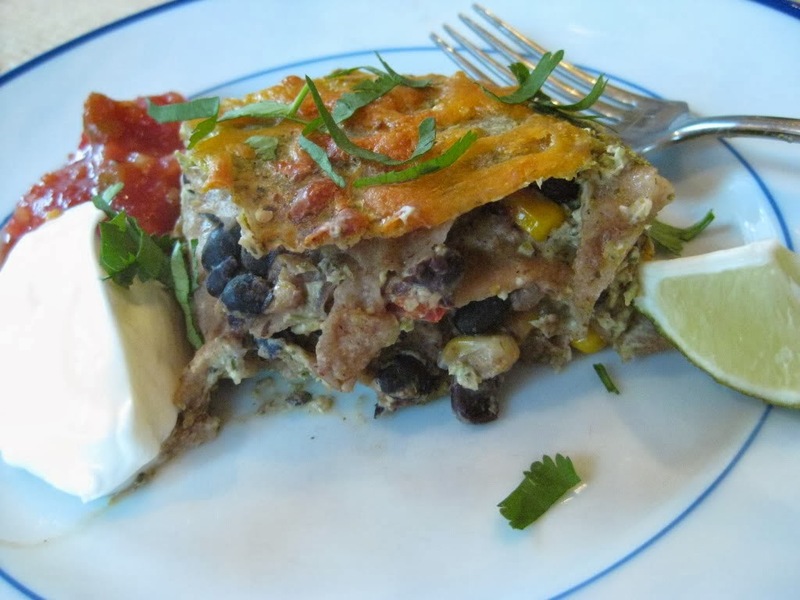 This handy one dish wonder combines your favorite parts of tacos in a layered lasagna to make it a breeze to bake and bring to the table. It is perfect for a Monday (or Tuesday, Wednesday…) night when you have after-school activities or have to work late. You can even assemble it in the morning and then simply bake for supper time happiness. We make our Taco Lasagna with black beans, but you can very easily substitute ground meat, turkey or even shredded chicken. Make it your own to suit your family’s tastes! If cooking immediately, preheat oven to 375 degrees. If making ahead, wait until you are ready to bake. In a large skillet over medium high heat, heat the oil. Once warm, add the onion, and cook for 4-5 minutes. Add the garlic, bell pepper and jalapeno, if using. Cook for 3-4 minutes or until the vegetables begin to brown slightly. Add the black beans (or meat, turkey or chicken) and corn and stir well. If using meat, turkey or chicken, cook, stirring occasionally until the item is fully cooked. Once the meat is cooked, or immediately if using black beans, add the taco seasoning and beer/water. Stir and bring to a heavy simmer. Reduce to a slow simmer and let simmer until beer/water evaporates, about five minutes. Remove from heat. In a medium bowl, mix the sour cream, cilantro, lime juice and salt and pepper to taste (probably about 1/4-1/2 teaspoon will do you). 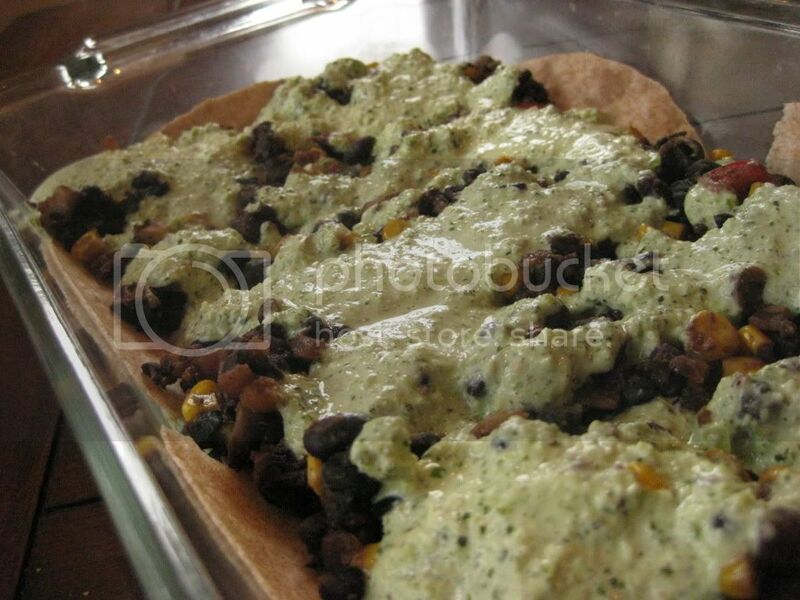 In a 9 x 13 baking dish, layer two tortillas to cover the bottom. 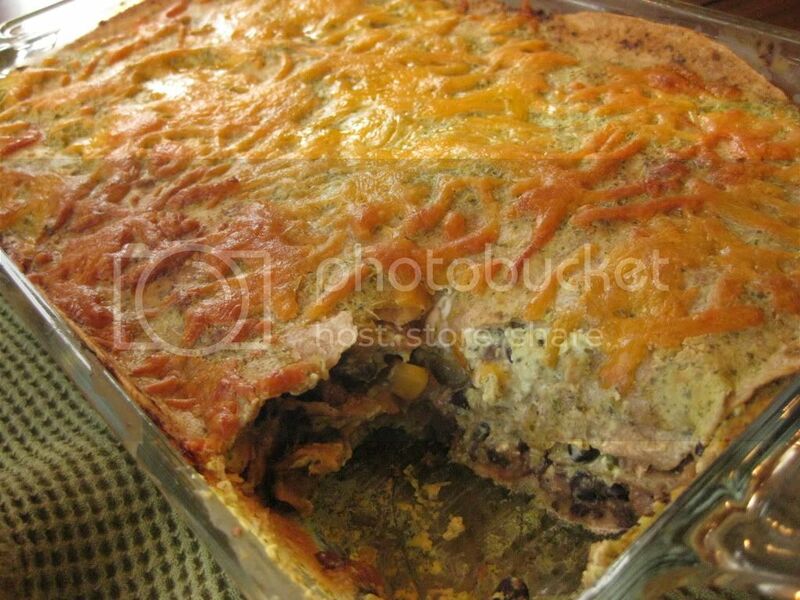 Add ½ of the black bean or meat mixture. Top with 2/3 cup cilantro lime sauce and 2/3 cup cheese. Repeat and then top with last two tortillas. Sprinkle with cheese on top. Bake at 375 degrees for 15 minutes. If baking a pre-made Taco Lasagna, add an additional 10-15 minutes. Bake until bubbly and the cheese is melted. Let stand 10 minutes before serving. I will try it next week for sure. Look amazing and so healthier than a regular lasagna. I literally just made this. We are having this for dinner later tonight. I made a few changes because of what I had in the fridge. I used portobello mushrooms and black beans as the main part of the dish. I ran out of sour cream so I used about a half cup of Greek style yogurt. I will let you know how it is. It looks delish! I have to admit I tasted along the way and it was so good! Thanks for sharing! Yum! It was really good. I will definitely make this again! Do you think this can be made ahead and frozen? Thanks!